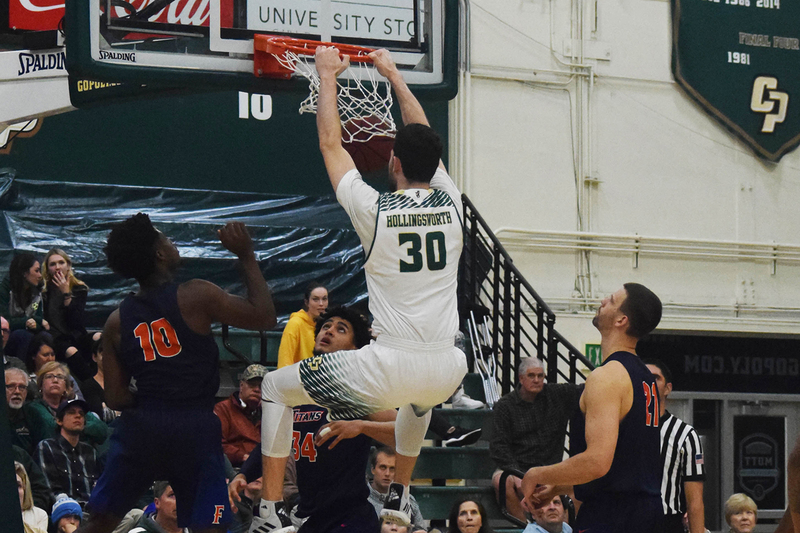 A surge in the second half by Cal State Fullerton led to Cal Poly Men’s Basketball’s fifth straight loss, 80-63 Saturday, Jan. 27 inside Mott Athletics Center. 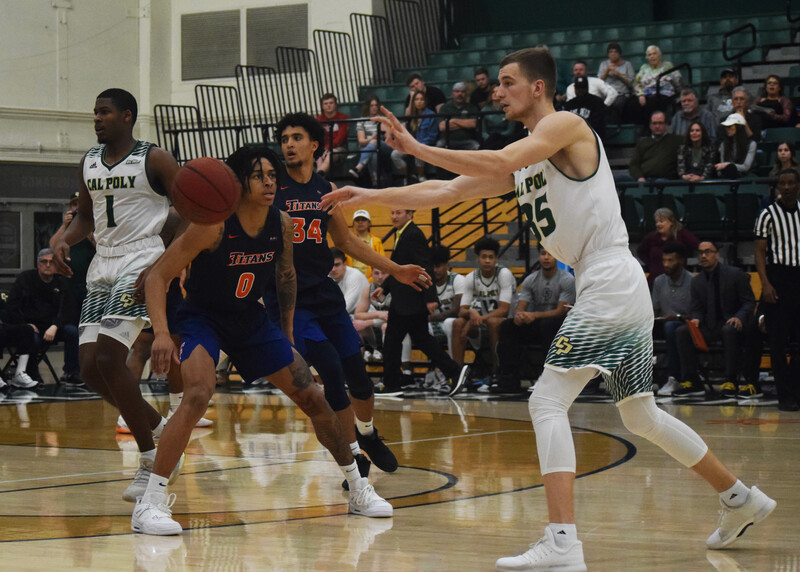 While junior guard Job Alexander scored a career-high 14 points and senior forward Kuba Niziol reached a season-high 15 points, the Titans’ potent offense made 56.5 percent of their shots from the field. With the win, the defending Big West Tournament champions Cal State Fullerton (8-12, 4-2 Big West) put themselves in third place in the Big West Conference, while Cal Poly (4-14, 0-5) are left in last place. The Mustangs are the only team without a win in conference play. Both teams started strong defensively, with no points scored in the opening minute. Freshman forward Daxton Carr created his own opportunity to open the scoring by drawing a foul 68 seconds into the game, but he missed both free throws. Carr then committed a foul, sending Fullerton’s Johnny Wang to the free throw line. Wang connected on both. This sequence foreshadowed the rest of the game, as the Titans scored on 26 of 36 free throw attempts, while the Mustangs only went three for nine. This was the second time this season that the Mustangs made less than 50 percent of their free throws. Cal State Fullerton quickly took a 6-2 lead, but senior point guard Donovan Fields broke up the run by arcing a three-pointer over six-foot-seven inch Titan forward Jackson Rowe. Fields scored the first five points for the Mustangs and scored nine of his 11 points in the first half. Big West Conference Player of the Week, Titan guard Kyle Allman Jr., pushed Fullerton ahead at 15-8 with 13:14 remaining until halftime. Niziol and Fields cut the Titans’ lead to three points, but Fullerton quickly took back their lead while Cal Poly scored at a slower pace. With 2:58 left in the first half, the Titans led 35-23. Threatened by the Titans’ longest lead, the Mustangs then played what seemed to be their best minute of basketball. After making a layup, Alexander broke up a Titan pass for a steal. He then spun around a Titan and set up Niziol for a three-pointer. Alexander’s 14-point performance in 28 minutes against the Titans came after being benched for the first three games of Big West Conference play and being taken off the starting lineup since the beginning of the season. “I’ve coached 33 years, and for Job to really be out of [the starting line up] for nine games … for him to step back up there … I thought that was one of the best bounce back performances,” Callero said. “We needed someone to come in and give us a little spark, and that’s what I was looking to do,” Alexander said. After Allman Jr. responded with a layup, Fields worked it inside the paint and passed it to Crowe, who drained another three-pointer to make it 37-31 with 1:11 to go. Junior forward Hanks Hollingsworth’s layup brought the Titans’ lead down to 37-33 with just under 30 seconds until halftime. However, the Mustangs’ momentum was halted when they gave up a layup with two seconds left on the clock. Cal State Fullerton led 39-33 at halftime. After Cal State Fullerton opened the scoring in the second half, Crowe strung together a layup and three-pointer to bring the Titans’ lead down to 41-38. Niziol and Fields combined to bring the Mustangs back within one point at 49-48 with 13:48 remaining. But for the rest of the game, Cal Poly never came within one point of tying the score. The closest the Mustangs got was within two points, after back-to-back layups by Alexander, with 11:12 on the clock. In the final stretch of the match, the Titans built their lead while continuing to make stops on the Mustangs’ offense. Cal State Fullerton recorded their largest lead of the game at 19 points with 51 seconds left on the clock. Cal Poly never held the lead in the 80-63 loss. 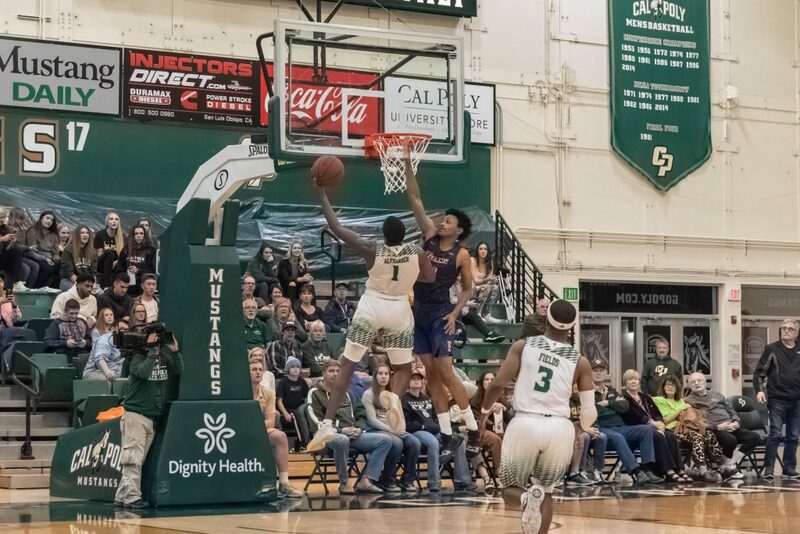 Looking for its first win of Big West Conference play, the Cal Poly team will travel to play a recent opponent, UC Riverside (8-14, 2-4), on Thursday, Jan 31. The Mustangs will then face CSUN (9-12. 3-2), who narrowly defeated Cal Poly in overtime on Saturday, Feb 2.